While doing this doll, my thoughts went to the doll's name "Return to Tara". Pondering on Scarlett's uncompromising love for land and home. "Land is all that matters, it's the only thing that lasts", Gerald 'O Hara tells his daughter. She would not realize his words until perhaps his demise. In the Philippines just a few months ago, the land that mattered, on which homes of many stood were devastated by a major flood. Rains for days poured, unrelentingly. No one was spared. People went to their roofs bringing whatever food or clothing and valuables they could. There is no rich or poor in the eyes of mother nature. Pets who were left tied died. Dogs, cats were seen hanging on trees and electric wires after the flood receded. A young couple was killed locked behind closed glass doors of a fastfood restaurant, perhaps thinking that the waters would not rise that high. When I think of Scarlett, I am inspired by her spirit and her want to "do anything to bring Tara back to what it was." But what of the inner Tara inside of her, and beyond that inside us. Can we bring back the splendour of what we were back to what it was? Scarlett had her answer and perhaps we should too. Courage or gumption. Nothing should take our inner Tara away from us "while we got breath left in our bodies". And so, we must conquer the world like Scarlett with her mother's curtains and roosters feathers on our head. This is why Gone with the Wind is immortal to me. 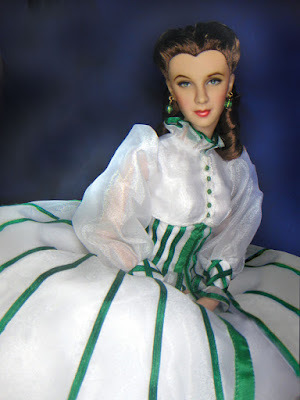 Beyond the love story, beyond the beautiful gowns, it is about the iconic and legendary Scarlett O' Hara who will forever be conquer whatever fate brings her way. This is how we create our own lives. There is no such thing as destiny. Destiny is whatever we make of our own fate. Tomorrow is another day!